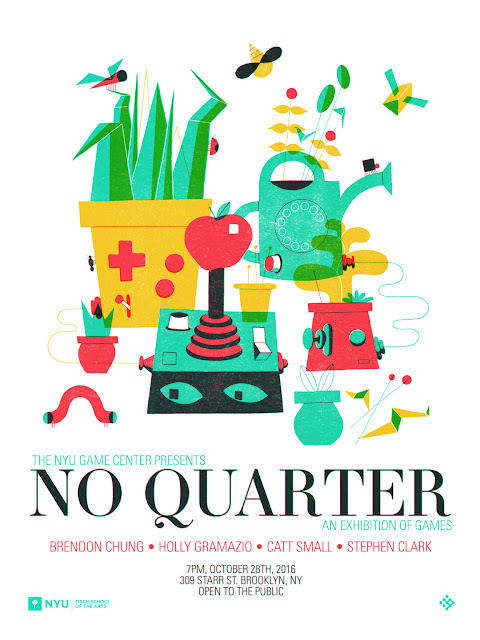 I currently curate No Quarter, an annual games exhibition sponsored by NYU Game Center. We basically pay 4 game designers to make whatever they want (and they keep ownership over whatever they make) and then fly them to New York City for a big fun party. This year the party is in Bushwick, Brooklyn, the current street art capital of the city, and we've commissioned Brendon Chung, Holly Gramazio, Catt Small, and Stephen Clark to make awesome games for us. It's going to be a fun night, I hope you can join us. Entry is free and open to the public, but RSVP is required.